To me, Klemperer's version is the one with better cohesion and spirituality. But Karajan, with Janowitz, Christa Ludwig, Wunderlich, has the better soloists. The version of Gardiner is interesting, very clear, with a fast tempo and a splendid choir. But it seems very superficial. The version of Goodman/Kvam (Nimbus), on the other hand, cannot be superficial - it is cavernous. Another version which I failed to list (mea culpa), but which still occupies a place on my shelves, is Bernstein/Concertgebouw on DGG LP. This was pieced together from live performances, but the result is impressive, at least IMO. 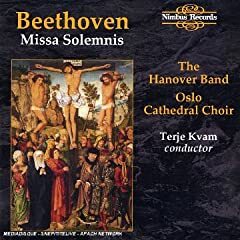 Concertmaster Herman Krebbers was on a roll during the time this recording was made, and his violin work in the Benedictus is quite beautiful. Anyone love this recording best? 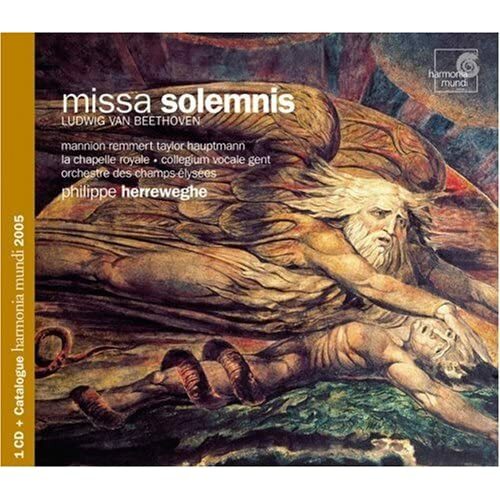 I have this version of the Missa Solemnis by Herreweghe on Harmonia Mundi. This is not a CD i go back to often, not sure if this is down to the work not engaging me, or the version itself; As it is the only version i have, my judgement is stopped short, but to this recording's credit, this is at the top end of my collection in terms of the singing quality, and the sound is just astoundingly clear and detailed, especially for a live recording. I would be interesting in hearing other opinions on this one. It is very good indeed (better than other HIP versions). But I'm looking for qualities of drama and monumentality that are alien to the HIP aesthetic: it is too light and fast for my taste. 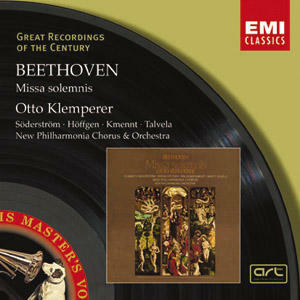 I have Klemperer on EMI. It's the first version I heard and it remains the definitive version for me. It just rings true and it conveys a sense of struggle and spirituality that is by turns uplifting and touching. I have heard a few other versions (although not the ones that have been highly recommended in this thread) and they all sound superficial by comparison (despite better singers, recording, etc). One of my favourite moments, where I think Klemperer is unique, is the end of the Gloria. Instead of trying to whip up excitement by going fast, Klemperer maintains an absolutely steady and slowish pace as the music grinds through an amazing and hair-raising series of key changes. I can still remember the thrill and astonishment of hearing this for the first time ..... each time it seemed that the tension could not go any higher Beethoven found a new gear, .... again and again. And with Klemperer's steady tempo there is a sense of monumentality and power that makes it an overwhelming experience. Out of curiosity I listen to other performances when I can, but I do not expect to ever find anything to replace Klemp. I was thinking of exploring this piece, I've never even bothered to give it a listen. Can I get some good recommendations (preferably hip) and possibly some suggestions on which part of it to tackle first? "I am the musical tree, eat of my fruit and your spirit shall rejoiceth!" Oddly enough I was just listening to this yesterday - the Gardiner version , which is an excellent HIP version. I agree: Gardiner's is quite good. I have a fondness for the Hanover Band's, however, and prefer their effort. Not exactly accurate since they use baroque instruments, but a truly excellent sound is achieved. I may be one of the few that thinks this is Beethoven's greatest work. That makes two of us. 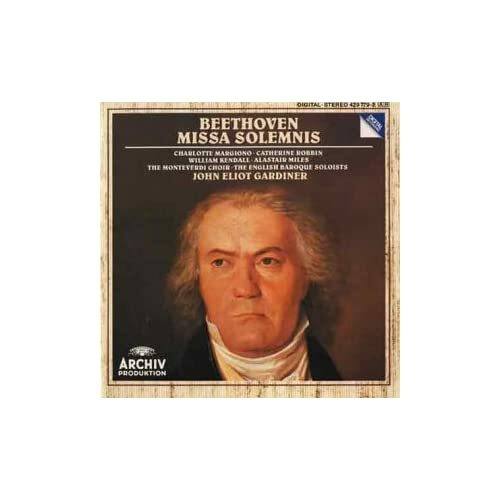 Missa Solemnis and late String Quartets are the best of Beethoven to me. Alkan puts the case very well. What makes you lean toward hip performances if you never heard it in the first place? I suggest you tackle the first part (Kyrie) and see where that leads you. The Kyrie is an immensely fervent and powerful piece. Normally you should be impressed enough to keep listening at least until the end of the Gloria. At that point you'll either be exhilarated or exhausted and that will dictate the course of your listening. I'm only familiar with the Gardiner version, which I am hugely satisfied with, to the point I've never considered the need for another version...I'm surprised there are many who think little of it. What the hey? Hardly any of us expects life to be completely fair; but for Eric, it's personal. That's the only Missa... I own. Or probably will ever own. I liked the Gardiner though. I've always loved Lennie's recording with the Concertgebouw, but hesitate to recommend it because I haven't listened to it in years. I recently have discovered that either my memories aren't so reliable or that my taste may have changed over the years so that old favorites are now un-favorites. The MS recordings are very tricky. Bunny, in that particular case your memory doesn't fail you. The Bernstein Amsterdam Missa (on one budget priced cd) is magnificent. Well, if we're going down the modern performance road (long overgrown and underkept in my neck of the woods ) then I'll note two version that I found well-done: Karajan's with the BPO and Toscanini's with the NBCSO. Karajan takes the 'awe-and-wonder' approach, which for him means slowing the tempo way down. I can't really stand it anymore compared to Gardiner's or the Hanover Band's, but I can see why some would like it. Toscanini's is a little more vivacious; not bad, that one. P.S. I'll have to check out that Herreweghe, didn't know about it before. Thanks for bringing it to my attention. In any event, I gave the cd a spin and was happy to learn that it lived up to my memories. Btw, my recording is a "panorama" with his 9th with the WP. That was one powerful pairing from DG. The 9th also lived up to my memories. Yay! As for budget, you know the Missa was recently remastered and they are asking $18.00 for it new.